Diamond Rock Concrete Solutions makes concrete floor repairs to commercial, residential, and industrial floors in Southwestern Ontario. If you have concrete cracks in your London, Hamilton, Kitchener, or Brantford Ontario garage, office, or commerical building, keep in mind that all pesky cracks can be fixed before growing in size, and there are several ways to do this. Flexible Concrete Caulk – We clean all excess dirt and debris from the crack and use a flexible caulk that bonds with the concrete. Epoxy Crack Kill – This method is used where more strength is necessary. At Diamond Rock, we also repair concrete scaling, crazing, and pitting. 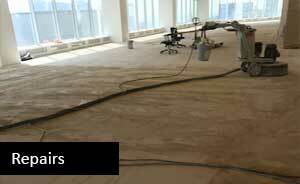 All concrete cracks, slopes, and imperfections should be remedied before any floor coatings are applied. For best results, crack and joint repairs should be done with epoxy and polyurea crack and joint filling materials. This will give you a smooth seamless surface with pores that the new surface coating can bond to. In some cases concrete cracks when it expands and shrinks with changes in moisture and temperature. 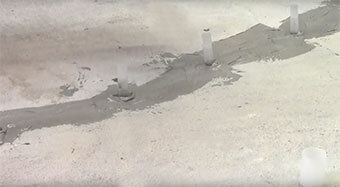 Contractors usually make control joints in cement as a way of controlling where the cement will crack. In the London, Kitchen, and Windsor, Ontario region, the most popular explanation for concrete cracking is the freeze-thaw cycle in the winter. During the winter months salt creates pitting and cracking. Concrete also cracks in the extreme sun as it expands and cools. 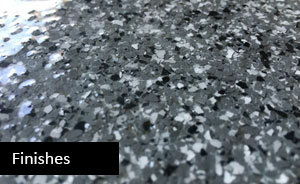 Once all cracks are repaired we can prepare your surface for your new flooring choice. 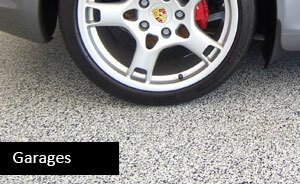 If necessary, we can provide concrete leveling and epoxy floor coating in a variety of different colors and patterns. For a free estimate on concrete floor repairs give us a call or send us a quick email message.